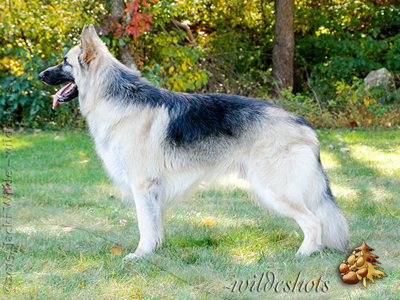 High Caliber Shilohs is excited to announce the breeding of our sweet, special girl Zayda to our handsome and loving boy Cam. 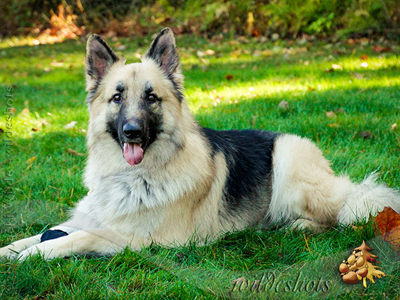 This litter will be full Shiloh with a single outcross, Chaos. It will bring together two dogs with extensive health testing and excellent hip scores, outstanding conformation, movement, and tail carriage, and confident, people-oriented personalities. Their puppies should also possess excellent structure and fluid movement along with playful and loving personalities. There should be some great show prospects as well as some with moderate working drive and also therapy dog personalities. These pups will be great, fun-loving family companions. NKC, ICKC, and ABI) in just one weekend each. At the age of merely 15 months, she also earned both the NSBR and ISSDC Grand Victrix awards! In addition to all her conformation awards, Zayda has also earned her Canine Good Citizen, Canadian Canine Good Neighbor, Adult Temperament Test and Therapy Dogs International certifications. Children seem to be drawn to her cheerful attitude. She always loves to play ball, but at the end of the day, her favorite thing is to snuggle against me just as close as she can get for lots of love and kisses. Cam is very playful, confident, and loves people, but also has just the right amount of protective instincts for his family with young children. His balanced conformation and impressive movement got him noticed right away in the show ring, winning Best Puppy at the Shiloh International Event Weekend, several Best In Show Junior, and Best Junior in the ICKC Shiloh Showdown weekend. He finished his adult championship in one weekend and is working toward additional show titles this year. Although he can be a high energy boy, he is very well-behaved on leash and is also very gentle with my one-year old son and will lie down and let my son sit down and lean against him. This litter will be all plush and all duals with medium to medium soft temperaments, high intelligence and willingness to please, and moderate activity levels. If you have enough time and love, and are able to include them in your activities, these pups should be an excellent addition to your family.